Shortly after crossing the narrow bridge from our camp to the vehicle, we loaded up for a full day in the bush. That meant a bush breakfast, a bush lunch and yes bush breaks. No problem here as the promise of lion cubs was just too much to miss. As we drove across the very short grass, I commented on how the animal density seem superior to what we saw in Lewa. Dominick, our guide quickly cleared that up by explaining that the animals prefer to congregate in the short grass-where they can see the predators in time to take flight. Since the grass leaving the camp looked very much like the cattle pastures back home, I asked why the grass was so short here. 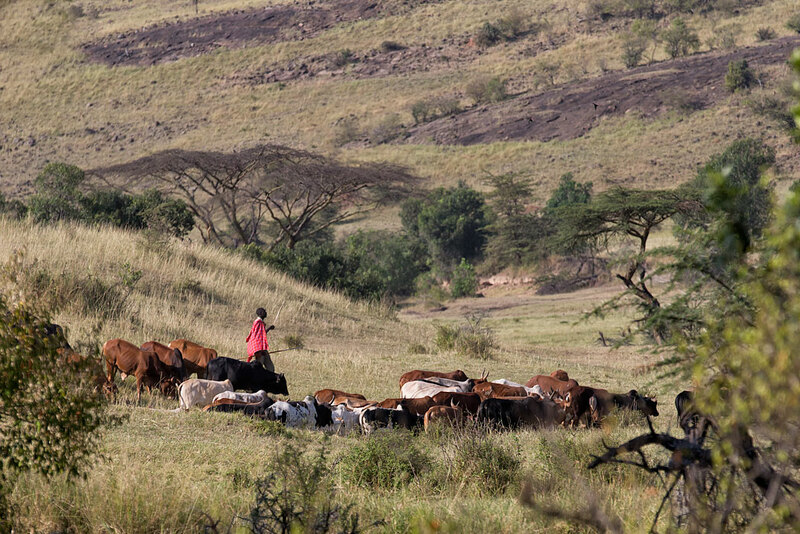 The answer was simple, the Maasai raise cattle and they take them to different parts of the conservancy to graze. And the cattle had been in the area around our camp. All seems logical now and of course throughout the day we saw Maasai moving their cattle through various parts of the conservancy. And we did see that when we went through areas that had tall grass, that the animal density seem reduced and similar to what we experienced in Lewa (although we would learn later that like Lewa, there were lots of animals hiding in plain sight in the taller grass). 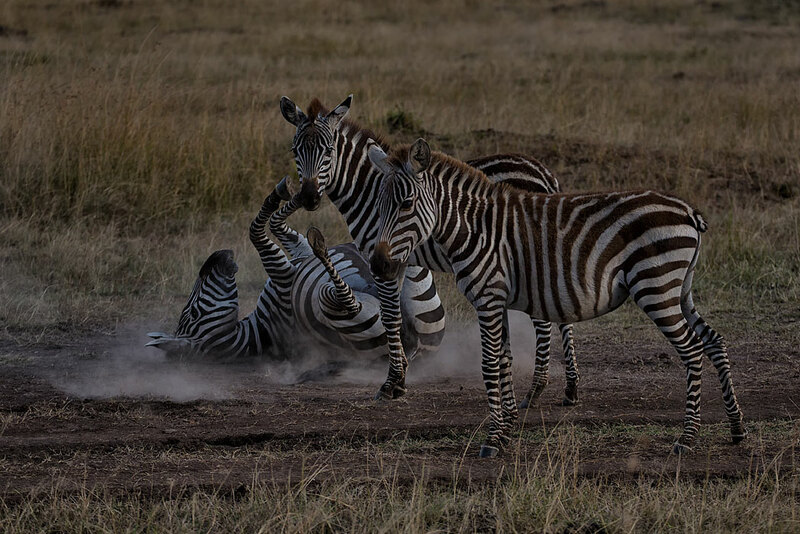 Now as the sun began to rise, we could see animals begin to stir such as some zebras that wanted an early morning roll in the dust. And next there were hyenas coming out of their den to see what the day would bring. 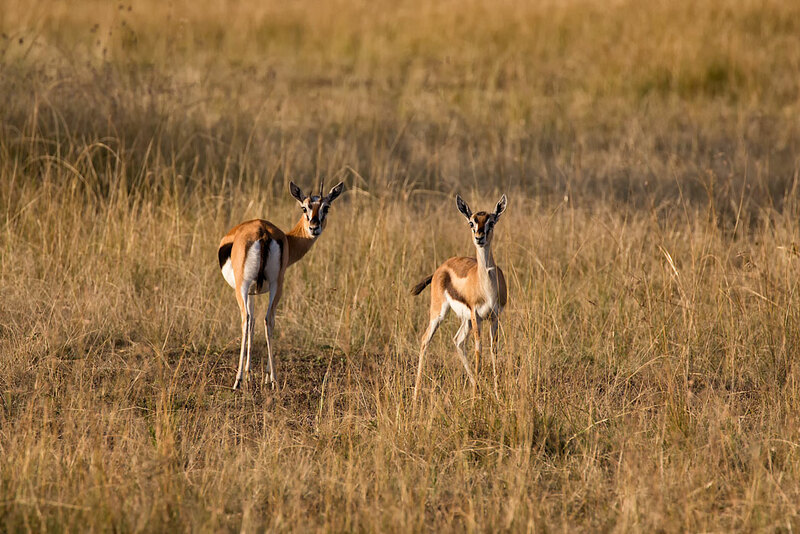 Young Thomson gazelles that are a favorite prey of the big cats are in big numbers in the short grasses and pause from grazing as we bounce by. Now after a short and sometimes bumpy drive we enter the famed Leopard Gorge-but we were not looking for leopards right now. Lion cubs were what we were hoping to find. Leopard Gorge is a rocky area that I knew from watching the many episodes “Big Cat Diaries” on the Animal Planet channel. 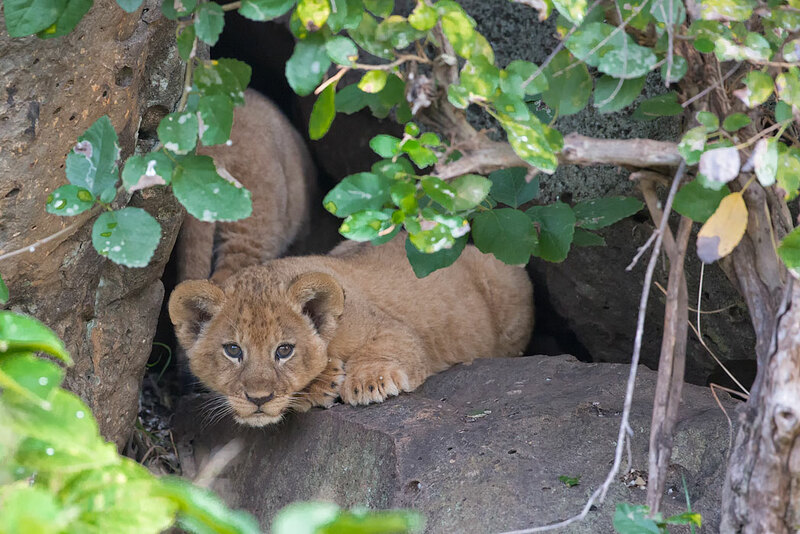 From that I knew the Leopard Gorge had places where the big cats hide their young. Hopefully that would be the case today. As we drive slowly through the gorge, we hear a barely audible “owwwwch”, owwwwch, owwwwwch! We turn and use the binoculars to look at the various creases and crevices in the gorge. And there in a small crevice in the rocks was a lion cub peering and calling out for its mom! 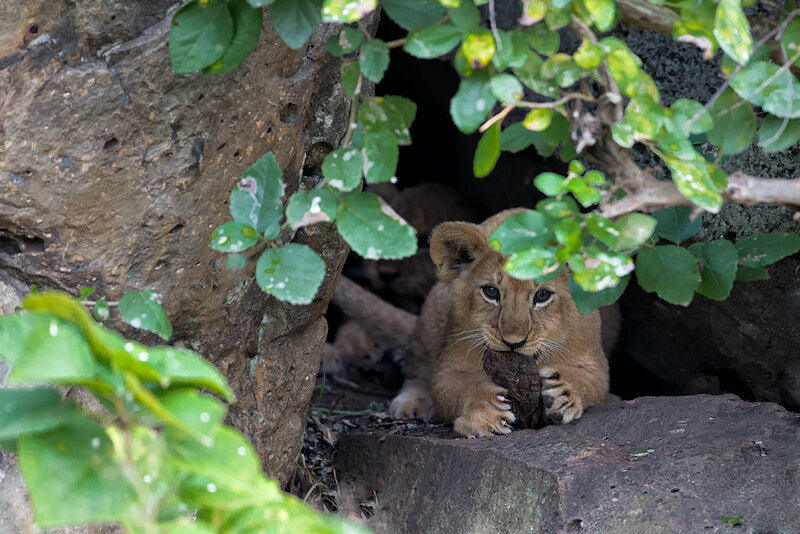 Initially, no response so the little lion cub turns into the hole in the rocks. Our spirit drops as we think its the last we will see of the cute cub and its apparent siblings. But moments later, the cub returns but with a big snack. Seems mom must have provisioned the den with food just in case she was a way for a while. Mom had apparently left some snacks for the cubs to enjoy while she was away. Periodically, the cub would pause from its snack and cry out “owwwwch, owwwwch, owwwwch”. But this time, there was a response! From back behind us, there was a low growl that to say it startled us would be a big understatement. 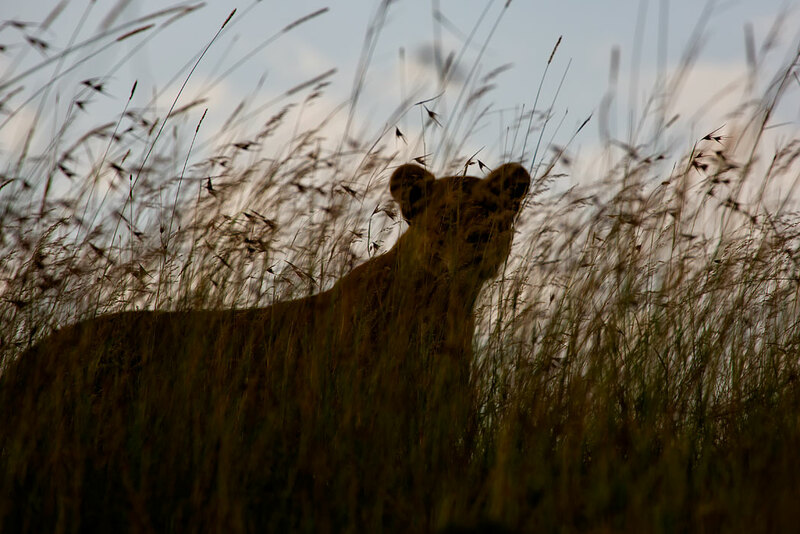 There standing tall in the grass as a silhouette was the lioness. Immediately, you could see the delight and confidence rise in the cub. And then another cub appears and then a third all responding to Mom’s low but rumbling growl. As the first cub climbs out of the hole in the rocks and tumbles down the grassy slope towards mom, the other two cubs quickly follow. The first cub emerges and Mom starts to pick it up with her mouth and return it to the safety of the den. Mom sighs and then turns to head back in the direction she came. Now it is time for us to also leave the gorge and see if we can see where mom is headed with the cubs in tow. Clearly the lioness is on a mission. The cubs struggle to keep up. Alternately, they sprint ahead, stop and then sprint again until they come upon some wildebeest. The wildebeest stare at the serious threat to their lives but the lioness does not even acknowledge them and plods on toward another lioness ahead. The curious cubs stop and stare at the strange looking creatures-and they at them. Of course, the whole world is new to the cubs so they stop and stare at the odd looking wildebeest-that return the stare as they are curious about the miniature cats. 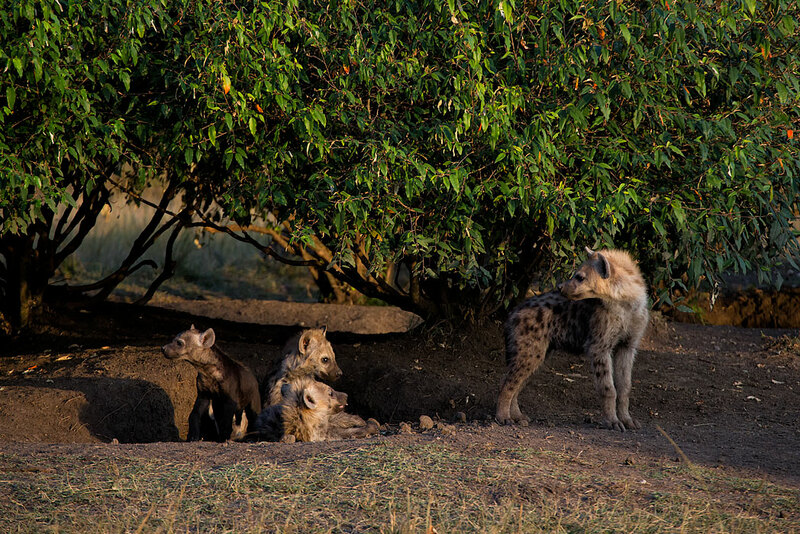 One cannot help but sense the irony of the mutual curiosity between the cubs and the wildebeest. After the cubs figure out that Mom is not waiting on them, they scurry and catch up. 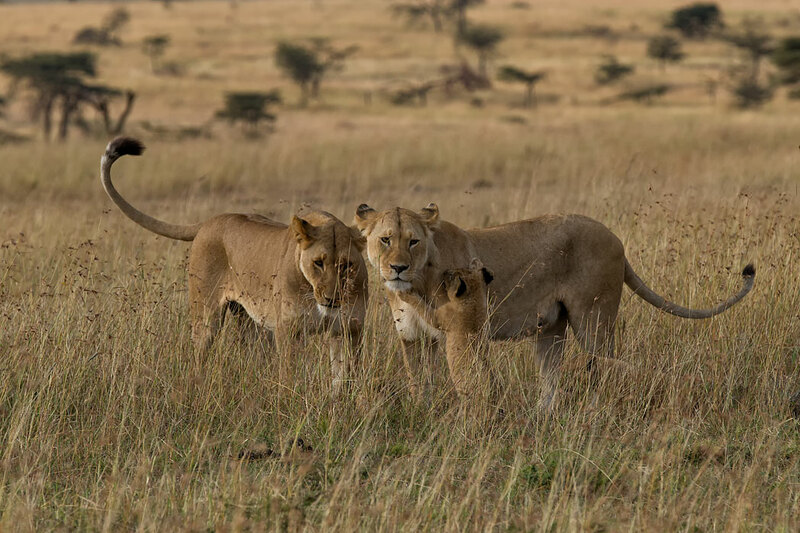 Suddenly, the cubs see another lioness that mom seems to be seeking out. Friend or foe? They look for a cue from Mom. 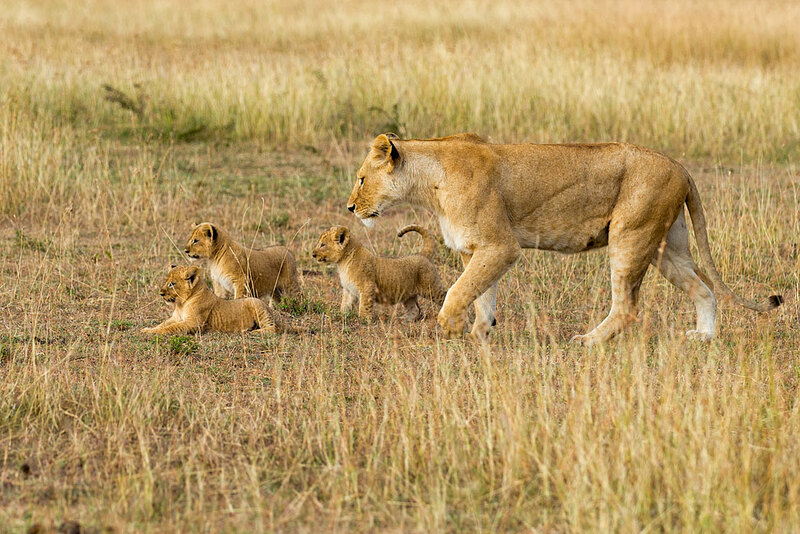 In a moment they see that the lioness is clearly Mom’s sister and they run to engage her in play. Mom’s sister had been guarding the remnants of a kill waiting for her sibling to return. 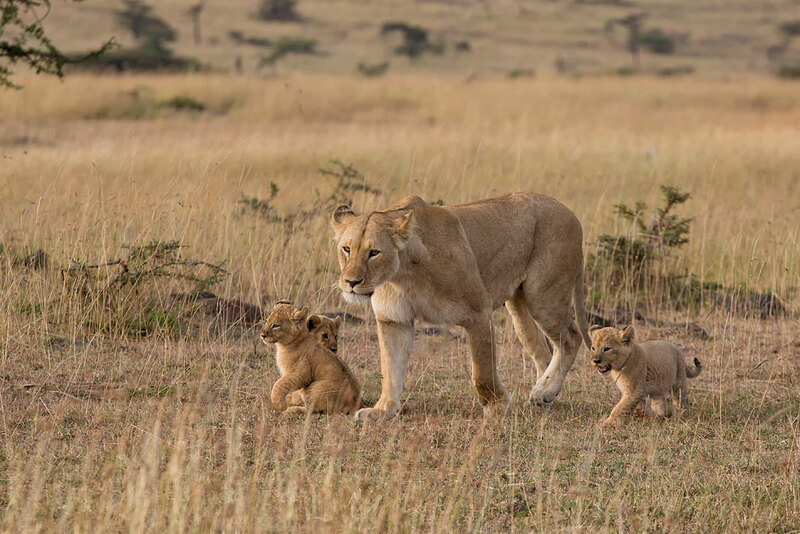 The lioness, the cubs and the glorious sunrise had been more than we could hope for. Now it was time to leave the lions. The adrenaline rush has left us quite hungry and thirsty. So we head off to find a quiet place in the shade where we enjoy a fine bush breakfast and reflect on the “wonder of it all”! Fascinating! Learned a lot I didn’t know about the habits of lions. That’s great! I love the pics. You are nailing the shots Steve, beautiful moments captured expertly. What a wonderful pictorial travelogue, Steve! Thoroughly enjoyed viewing your images and reading your diaries.